(HARLINGEN) – Early on, James Cho knew that his calling was in the dental field so when he found the Dental Hygiene program at Texas State Technical College he knew it was the place for him, although there was one major challenge during the program that almost destroyed his dream. 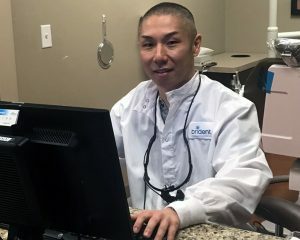 The South Korean native was working as a dental assistant in Brownsville, after completing an online dental assistant certification program, but he wanted more. 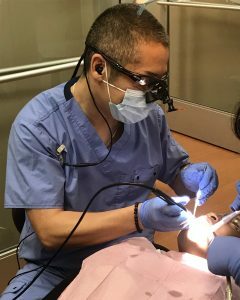 “After working as a dental assistant for five years, and observing the duties and the care the dental hygienists and the dentists provided to their patients, I knew I wanted to do that too,” said Cho. So after he began researching programs and realized the time it took to be a dentist was not in his cards, he chose the next best thing, TSTC’s Dental Hygiene program, the only program of its kind in the Rio Grande Valley. The 39-year-old ended up being one of the highest scoring applicants who got accepted into the two-year program and earned his associate degree in 2017, with a 3.75 GPA and a job offer in hand. But, this wasn’t almost the case. While in the program, Cho went through a difficult divorce and became a single parent, which he says was disheartening and depressing. Cho now works as the area dental hygienist with Brident Dental and Orthodontics in Austin, in charge of all three clinics in the area. He made the move to Austin with his now 14-year-old daughter to have more opportunities to choose from and take advantage of the higher salaries outside of the Rio Grande Valley. As a hygienist, Cho is a patient’s key educator about oral health. He treats patients who are diagnosed with gingivitis or periodontal disease, coaches on nutrition, plaque control and overall oral health and delivers professional whitening services. Cho said what he has become today is the product of the experiences he had during his time in the dental hygiene program. So, what’s in Cho’s future? He will be starting classes soon to become certified as an orofacial myofunctional therapist, to help patients overcome disorders of the muscles and functions of the face and mouth. For more information on TSTC’s Dental Hygiene program or the services offered at the TSTC Dental Hygiene Clinic, call 956-364-4696. This entry was posted in Harlingen on June 11, 2018 by Amanda Sotelo Sotelo.